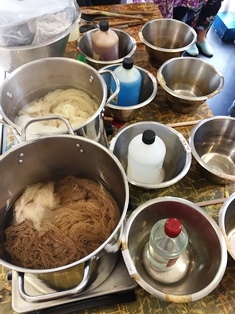 At the second session of this course we continued washing animal and vegetable fibres and mordanting them with aluminium and tannin. 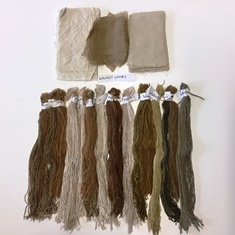 We also dyed wool, silk, cotton and linen samples using walnut leaves and walnut hulls (Juglans spp.) 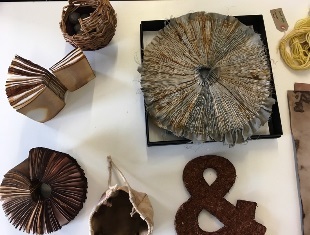 After dyeing, the samples were then treated with an acidic modifier (clear vinegar), an alkaline modifier (soda ash), a copper modifier and an iron modifier. 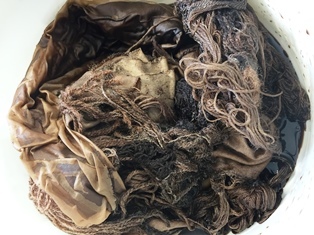 Dyes from walnut leaves and hulls do not require a mordant, so the samples had only been thoroughly washed before dyeing. I usually fill bottles with the modifier solutions in advance, so they are ready to use when needed. It is easy to adjust the quantity added, according to the depth of colour change desired. Start by adding a little modifier solution and then add more if the colour change is too insignificant. Keep the unmodified sample to hand, in order to check that each modifier result gives a slightly different tone and all are a little different from the unmodified samples. With some dyes the differences in shade can be quite dramatic, while with others the differences may be difficult to discern. Fresh green walnut hulls, if used before they turn brown, can give lovely rich deep browns but dried walnut hulls usually give paler browns. 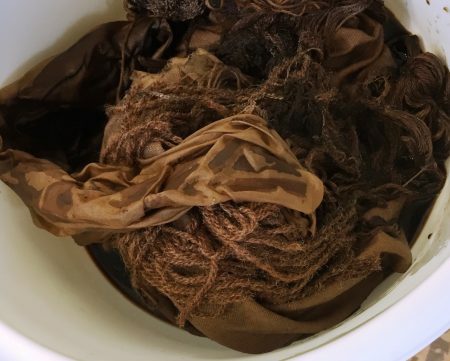 As we only had dried walnut hulls, we conducted a further experiment with them to attempt to achieve a deeper brown by making the pH of the dye bath more acidic. So after simmering the walnut hulls to extract the colour, we added clear vinegar to about pH4 and then dyed some fibres in the usual way. This produced a deeper brown. 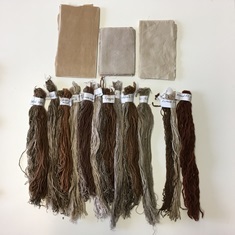 Above: silk, linen, cotton Below as for walnut leaves with extra samples far right showing the results from the dye bath to which vinegar to pH4 had been added. Note that the colour on the wool and silk samples is considerably deeper but the cotton sample shows little difference. Note: Adding some oak gall solution to the walnut hull dye bath also gives a deeper brown and this is an attractive grey/brown. The oak gall solution can be added to the walnut hull dye bath either in addition to the vinegar or instead of the vinegar. (As a rough guide, add about 250mls oak gall solution per 2 litres of dye solution.) I often use an oak gall exhaust solution in this way. In general, dyes from walnuts are more suitable for animal fibres, unless copper or iron modifiers are used. At this session we also had a “Show and Tell” table. 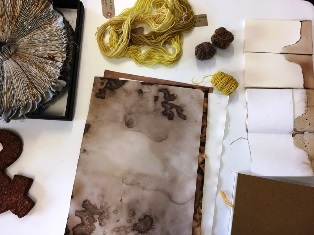 The photos below show some of the items on the table, all made by the students using the natural dyes we have sampled so far.